The gavel slams and the judge declares, “Guilty as charge!” Someone you did not expect over hears your gossip and confronts you. You are caught with your hand in the cookie jar just moments after mom told you no more cookies. Guilt. What is it? What if you got it? God desires us to change from our sin, the guilt of our sin, and back in his glorious grace. There is a great sadness that comes from not being saddened by knowing our sin. As observed in the first narrative in the Bible (Gen.3:1-13), Adam and Eve desire the fruit of the forbidden tree and disobey God to have it. Their disobedience leads to guilt and a cover-up. Rather than disobedience and covering up sin the Bible is clear on how one should deal with the guilt of sin. Guilt is a close companion for a Christian because it points us to our need for Christ. Guilt is a real reminder that I must not sin anymore, and that I need to follow Christ (Gal.3:24; Rom.5:8). Like stated above: guilt is good. 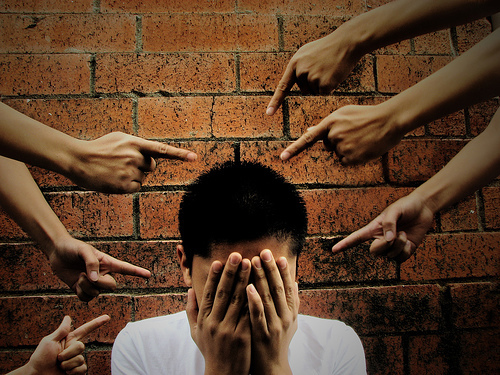 How does one deal with guilt biblically? First, acknowledge your specific sin (Prov.28:13; Ps.51:4; 1 John 1:7-9). Second, confess to God that you have sinned. Confession is simply agreeing with God. Calling your sin, sin. Third, if the person is unsaved they must confess Christ as their Savior and forgiver of their sins (Rom.10:3-10). Finally, if the person is saved they must confess to God their sinfulness and continual need for God’s grace. Now there is so-called false guilt, which is disobeying what one thought was God’s Word and continuing on in their same sinful patterns. This is a misuse of what God’s Word says about guilt, and this one needs to confess their sin. What about false guilt? Guilt is guilt. True guilt or false guilt it is culpable for sin. 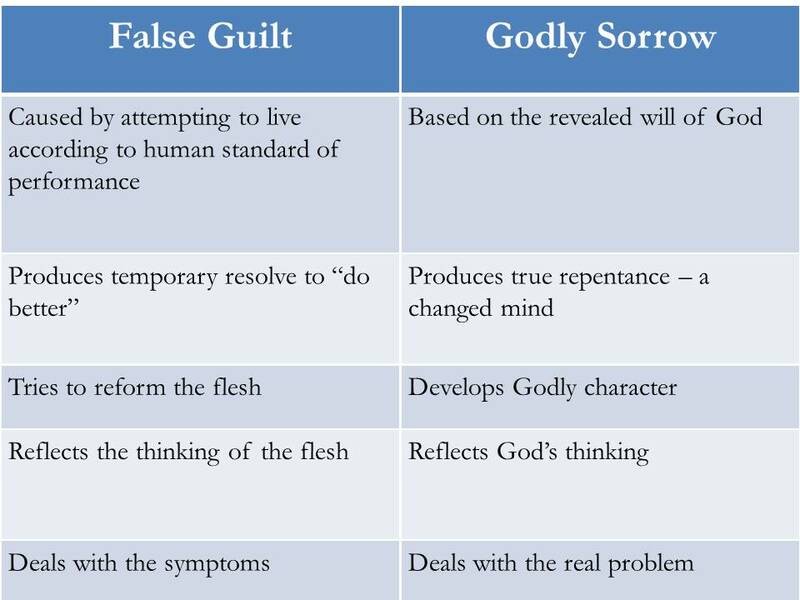 False guilt has nothing to do with what’s true and accurate, nor is it related to true repentance, but is still must be dealt with as a sinful response to what is false. For example, a girl could have been molested as a child and respond in guilt over a situation in which she committed no identifiable sin. Even though she committed no sin, her guilt is a sinful response to the situation. The Scriptures say that “Whatever is not of faith is sin” (Rom. 14:23). This girl may have been blamed or punished for things that she didn’t do, or been told she was worthless. A person with extreme guilt over something that was not a sinful act needs to work on viewing their behavior with the truth as revealed in Scripture so that they can live in peace and experience freedom in Christ. Guilt caused by sin requires an understanding of confession and forgiveness. The Holy Spirit working in the conscience triggers this kind of guilt. The individual should desire to do something about the sinful behavior. By resting in the grace of God and seeking His forgiveness and restoration I can experience freedom from guilt. Guilt must be dealt with, otherwise it begins to distort other problems in our lives (Gen.4:11; Prov.28:1; Eph.4:26-27). I do not deal with guilt by dealing with the feelings of guilt, though I do not discard the feelings guilt may bring (Ps.32:1-5; Prov.14:30; Ps.38:1-8). The feelings are rooted in the problem that made one guilty; therefore the problem is what needs to be dealt with. When we deal with guilt biblically God promises us restoration (Lk.15:11-32; Mt.5:23-38). We also are seeking to be God’s kind of people by changing our thinking and behavior (Rom.6:11; 1 Cor.6:9-11; Eph.4:22-24). J.I. Packer, Christianity Today (January 2005), p. 65.